My blogs here on Facebook are mostly about my spiritual Odyssey and related topics, but I also blog elsewhere on photography forums. I don't post those blogs here because they are too technical and would not be interesting to most of my Facebook friends. Instead, here I post a few nature photos along with my blogs. My interest in nature started when I was six-years old. I was raised out in the country, the only house as far as I could see (I was small), wedged between two large farms. Back then I didn't have a camera (there were no TVs either), so I mostly recorded what I saw of nature in my mind. In 1956, when I was fourteen, my parents sent me on a 6,000-mile trip around the country in an old school bus filled with kids my own age. We camped all the way, cooked our own food, hung out, and saw some of the world. Before I left on the trip, my dad loaned me one of his cameras, a Kodak Retina IIa, and briefly taught me how to use it. For some reason on that trip I took to photographing, perhaps because I was seeing so much that I have never seen. I even spent all my spending money on more film rather than snacks. When I got back home and had my slides developed, dad was shocked at how good many of my photos were and he was a very skilled photographer. That was the first time my father was ever pleased with something I had done, so I went on from there. I have never been interested in doing photography professionally because I made my living doing other things. Photography for me has always been just a fun way for me to be out in nature. More and more people have cameras these days, if only on their iPhones, so there seems to be a growing interest in close-up nature photography. This e-book is part of a two-volume series that is not so much a tutorial on photography (or nature), as it is about some basic information that should be interesting to many of you wanting to get into close-up nature photography. I will mostly cover the gear that you might need and something about some of the techniques involved in close-up photography. 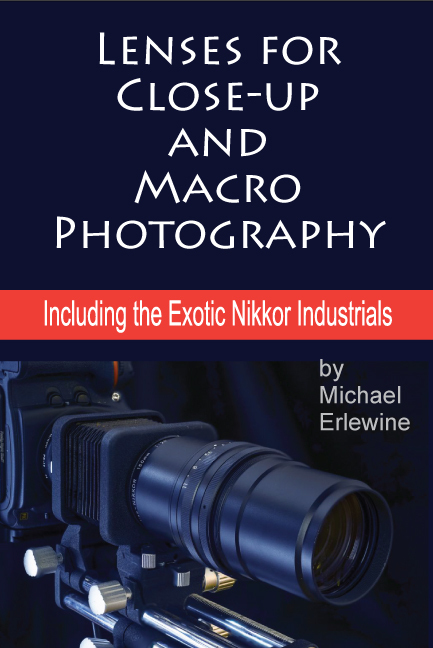 This first volume is all about lenses that can be used for close-up and macro photography and is called, appropriately, "Lenses for Close-up and Macro Photography." A more general volume on choosing camera equipment is almost ready, but this one came out first. I don't expect this to interest many of my Facebook friends, but I thought you might like to at least know it exists. Finally, I have a number free e-books (some listed below) on photography that may be more on the entry level, so I list the link to those here. They are all free. Just scroll down and see what looks good.